A rugged and determined prop for Bath and also the chairman of the Rugby Players' Association, Barnes made over 200 appearances and was England Saxons captain for the 2006 Churchill Cup. 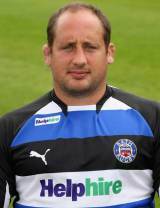 During the 2006-07 season he appeared in every game for Bath and won the European Challenge Cup with the west country side in 2008. He was forced to retire by a neck injury in April 2011. In his capacity as head of the RPA Barnes ensured the welfare of England's professional players. In 2008 he scaled Kilimanjaro, Africa's tallest mountain, to raise funds for the Benevolent Fund and for the Tamara Johnson Trust Fund. Johnson, a Bath ladies player, sustained serious back injuries on the field during the 2007-08 season.